When Sandra Saba found out the University did not rehire her favorite professor, Bobbie Jo Duffy, she began demanding answers from Pitt’s administration about transparency. Saba asked for better treatment of adjuncts and, above all, the return of Duffy to the American Sign Language department. 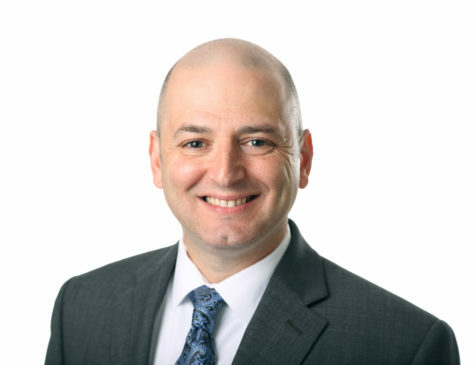 Duffy worked at Pitt for five years as an adjunct professor and signed a one-semester contract in August 2013 as a part-time lecturer to teach American Sign Language in the fall 2013 semester. The University informed Duffy in November 2013 that her contract would not be renewed for the spring semester. Duffy, however, is not alone in this position. Long-term contracts are hard to come by in academia. According to the American Association of University Professors, more than 50 percent of all higher-education faculty hold part-time appointments, and 76 percent of all instructional staff appointments are for non-tenure-track positions. The AAUP recommended that no more than 15 percent of instruction within an institution and no more than 25 percent of instruction within a department be from non-tenure-track faculty. According to the 2013 Pitt Fact Book, 621 out of 1,163 total Pitt faculty were non-tenure track at the time of its publication. Out of the 621 faculty members, 417 had part-time contracts. According to Robin Clarke, a lecturer in the English department and also a member of the Volunteer Organizing Committee of the Adjunct Faculty Association, roughly 68 faculty members in her department last year were part-time, 36 were full-time, non-tenure-stream faculty members and between 50 and 60 were in the tenure stream. Tenure stream faculty members include part-time faculty and full-time faculty on the track for tenure, which is, according to Pitt’s Office of Faculty Affairs website, “a status accorded to members of the University faculty who have demonstrated high ability and achievement in their dedication to the growth of human knowledge.” Tenure assures the University that there will be a continuity in its experienced faculty and in the functions for which they are responsible. Saba, a sophomore majoring in English literature, said she found out Duffy was not returning during the last week of classes when Saba asked Duffy to write her a letter of recommendation for the ASL certificate. Duffy said her classes had high enrollment numbers. After she found out Duffy would not be returning the next semester, Saba and Chelsea Samo-Lipman, a senior majoring in psychology and a former teaching assistant for Duffy, drafted a petition consisting of quotes from students about Duffy’s teaching. The students visited ASL classes and collected more than 70 signatures in two days. Saba said she and Samo-Lipman met with Deborah Hast, coordinator of the ASL program, and Claude Mauk, director of the Less-Commonly-Taught Languages Center, last semester to discuss the petition and ask for a response. A small group of the former students, friends and young community activists met a week before the protest in a private study room at Hillman Library to discuss the details of their first demonstration. 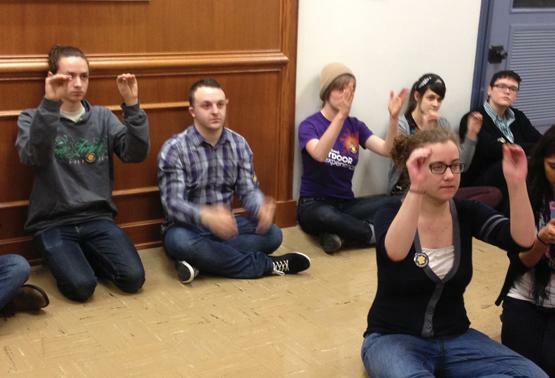 Since the University had taken away an ASL professor, they would teach their own ASL lesson — outside Cooper’s office. 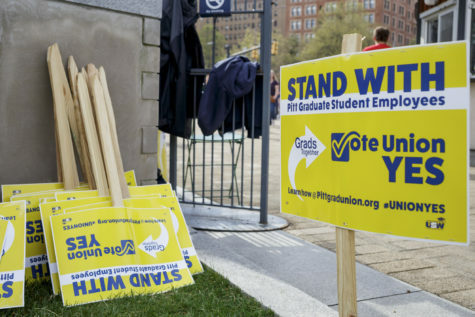 The students rallied on Facebook by calling for their peers to support adjuncts with event invitations to the “lesson” and posting instructions alongside the group’s spearhead image: “Have you seen my professor?” in blue and gold alongside a Pitt paw print. 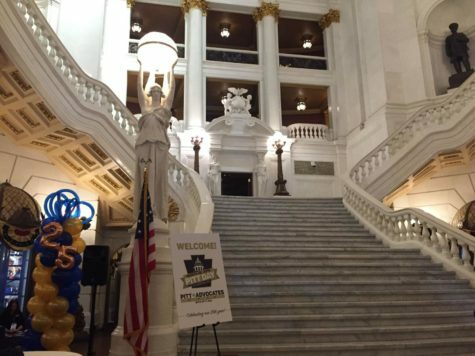 Duffy’s former students, as well as various undergraduate supporters, Ph.D. students and adjunct professors from Pitt and Duquesne, formed a small crowd of roughly 30 people that lined the hallway surrounding the office. After a University employee informed the group that Cooper was in a meeting, the group decided to wait it out and begin the lesson, anyway. Samo-Lipman taught the class the first phrase, “Where is our professor?” and was about to demonstrate the movements for, “Give our teachers long-term contracts,” when Cooper emerged from a stairwell and began walking to his office. Despite being “in the dark” about the demonstration and Duffy’s situation, as he put it, Cooper stayed for the remainder of the lesson. After Saba presented Cooper with a letter detailing the group’s demands — which asked for a response from the University by Friday — it was the dean’s turn to speak. “Well, you clearly are a very committed and serious-minded group,” he said to the crowd sitting cross-legged on the floor below him. According to Clarke, however, there are no such processes. Clarke said if the University does have such policies and criteria, faculty may not agree with its standards. 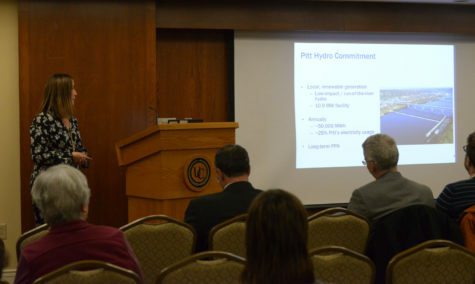 University spokesperson Ken Service said Pitt requires each school or unit to have clear policies or guidelines for non-tenure-stream appointments, which the Office of the Provost reviews periodically. Duffy said it wasn’t her place to encourage the student’s movements. 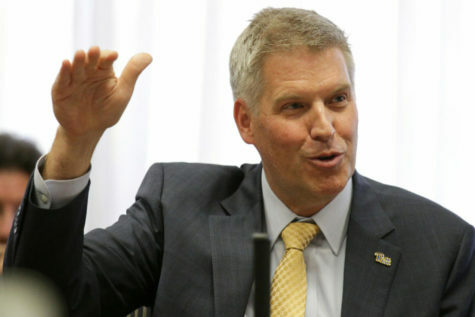 Clarke said the exploitation of adjunct professors is a national problem, and Pitt’s quality of education and reputation in academia would benefit from taking a progressive stance. Part-time professors in the English department make $2,700 to $4,100 per semester per class, and part-time professors can teach up to two classes a semester, according to Clarke. Clarke said the University benefits from the treatment of non-tenure-stream faculty, and the low salary allows them to fund other projects. The AAUP contends that the turn toward adjunct labor is “largely a matter of priorities, rather than economic necessity.” The greatest growth in contingent appointments occurred during periods of economic prosperity. Service said the Office of the Provost and the Council of Deans are currently reviewing and addressing salary issues in addition to working with an ad hoc committee of the University Senate to identify additional concerns of faculty outside of the tenure stream. 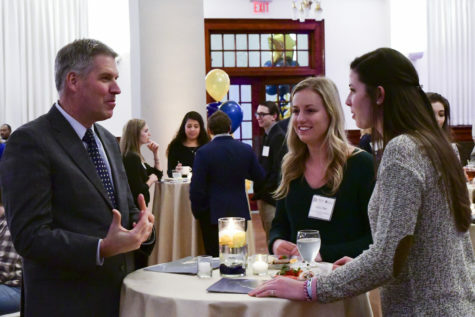 He also said the provost’s office and Council of Deans improved job security by consolidating part-time positions into full-time positions, and the importance of career development for non-tenure-stream faculty is a priority. Through Service, Cooper responded to students by early Friday morning. 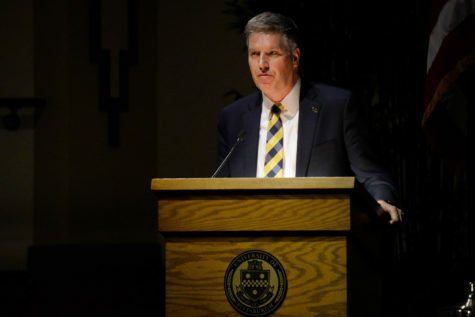 In a statement emailed to Saba and The Pitt News, Cooper said that while the University appreciates its students’ interest and active engagement in their education, the administration is not legally permitted to comment on personnel decisions. “There are thorough and multi-level processes for all such decisions, which have been carefully followed in this instance,” Cooper said. Cooper said the ASL program is fully staffed, and the decision to not renew Duffy’s contract will have no impact on the program. Saba said she believes it’s the students’ right to know the rationale behind personnel decisions. Clarke became involved in the movement after Saba, who is a TA for her seminar in composition class, came into the class livid about the loss of her professor. “For every year that I feel comfortable that I have my job, there are 10 adjuncts in my department who don’t know if they have theirs and make half my salary for the same classes,” Clarke said. 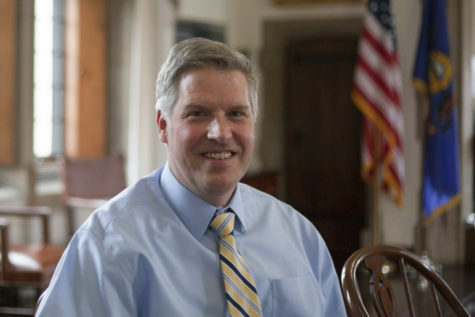 Robin Sowards, an adjunct professor at Duquesne University and organizer of the Adjunct Faculty Association, used to be an adjunct professor at Pitt, but was not rehired after the University took his fully-enrolled class from him and gave it to a senior member. “We are sort of replaceable parts,” Sowards said. 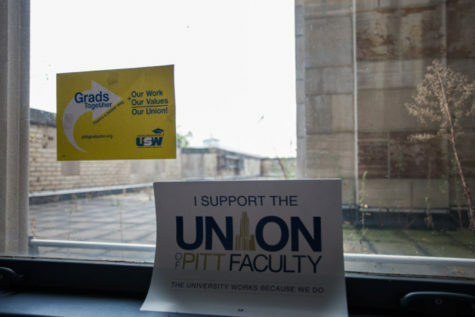 The Adjunct Faculty Association, which works to improve the working condition of non-tenure-track faculty in the Pittsburgh area and is a chapter of United Steelworkers, helped the students secure funds to pay for buttons that protesters wore during the demonstration. Clarke said the group offered some advice and showed their support, but said it was largely a student movement. When the lesson was signed and done and the message was heard, Cooper entered his office, and the group signed applause for itself. But Saba said class will reconvene in the fall, and the group will continue to ask questions. Saba said the class was only the first step.